Buckminster Fuller Bibliography by Trevor Blake. Paperback, 240 pages. 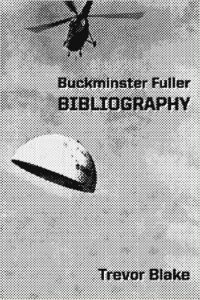 The Buckminster Fuller Bibliography is the most complete and accurate bibliography of “Bucky” Fuller to date. One thousand five hundred entries by and about Buckminster Fuller. Books, magazines, newspapers and ephemera published between 1914 and 2015. Trevor Blake is the author of Max Stirner Bibliography, Portland Memorials and other books.